Welcome to Issue 32, and we are very delighted indeed to welcome you to this fabulous issue because not only do you get a FREE die, you actually get three FREE dies and a CD ROM! Your free gift this issue is the Charisma Sweet Poppy die set and CD ROM. Charisma dies are designed to work with print outs from a CD-ROM. The CDs consist of image sheets in lots of different tones, in this case the Sweet Poppy. All you have to do is choose the image sheet, print it out and use the matching dies to cut out the image. No scissors, no tiny pieces to wrestle with. Perfect if you love your decoupage, and you can print out and cut out as many time as you like. There are six lovely projects to inspire you, but we’re sure you will have so many ways to use this great gift! 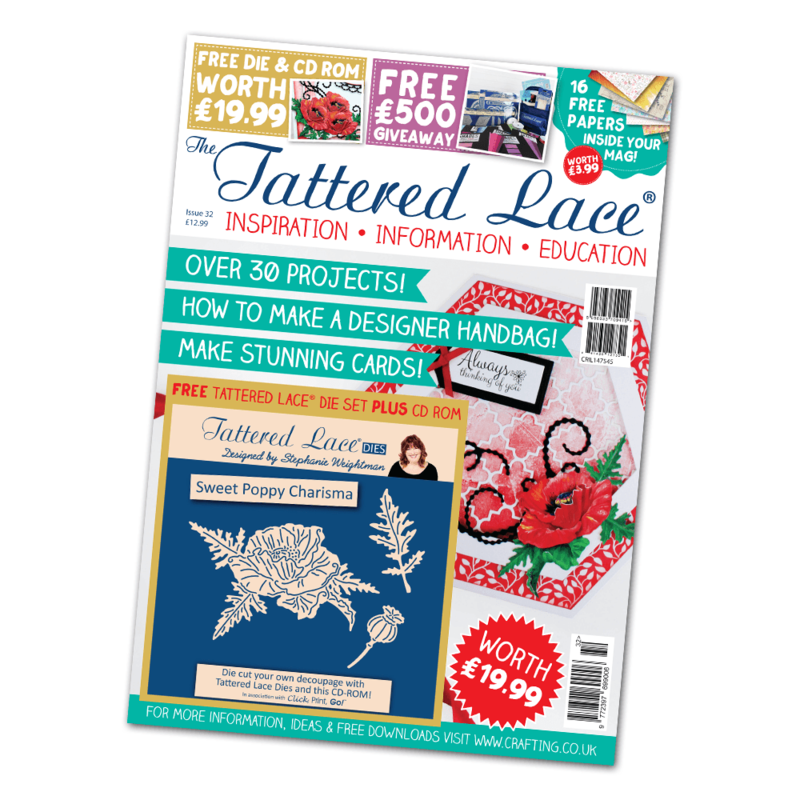 The rest of the magazine is a pot-pourri of something for the guys, something for the handbag fans, something for the dancers and lots left for all those generic cards and projects that we love to make. The Salsa Couple projects really are very special, making cards full of sassiness! The handbag template can be used to make the best gift bags ever and don’t forget to make the “charm”. The Floral Craft a Card projects show you just how versatile this die set is, perfect for those easy cards. So get ready for a great read and to plan on getting crafting!